Drought and extreme heat cause a 10% decrease in global cereal production, 5-7% reduction in yield annually (Lesk et al., 2016). tolerance to drought and heat (Wiebe et al., 2015). Hypothesis: Organic farming can lead to improved soil health and increase in organic matter which will improve hydraulic properties. The proposed project aims to evaluate water retention, hydraulic conductivity, and organic carbon-nitrogen in organic and conventional systems. In spring 2018, soil samples will be collected from 0-30 cm in 10 cm increments from FST plots and analyzed using the HYPROP/WP4C devices to determine water retention, KSAT to determine hydraulic conductivity, and dry-combustion to measure organic carbon nitrogen content. A statistical evaluation of the relationship between farm management practices and soil hydraulic properties will be conducted. The results will help farmers determine the most effective farm management practices that improve soil quality and build drought resistance. • Objective 1: Measure soil hydraulic conductivity and water retention properties in soil cores collected from six different organic and conventional crop management systems at the Rodale FST. • Objective 2: Assess soil organic carbon and nitrogen content in six different organic and conventional crop management systems at the Rodale FST. • Objective 3: Correlate soil organic carbon-nitrogen to hydraulic properties and determine the optimal practices that lead to drought resistance and improved water holding capacity. This project aims to determine how and to what extent does organic farming affect water retention and hydraulic conductivity, leading to drought-resistant and farm ecosystem. From a system-wide perspective, the proposed project will help determine if sustainable and organic farming provide a practical and economically viable climate adaptation method by quantifying the hydraulic characteristics that develop in the soil. systems at Rodale Institute’s Farming Systems Trial. flood mitigation and improved water retention properties. With great help and assistance from Rodale Interns, Researchers, Dr. Daniel Gimenez, Graduate Students and Dr. Josh Caplan samples proposed were collected from Rodale’s Farming Systems Trial in July 2018. We collected soil composite samples using a soil probe at 0 – 10 cm, 10 – 20 cm and 20 – 30 cm. The composites were combined from 10 different location from 24 FST experimental plots (consisting of six different treatments replicated four times). The samples were then air dried in the laboratory and sieved through a 2mm sieve in order to remove rocks/pebbles/POM. Sieved samples were weighted to define the <2mm and >2mm particles of each sample. Dry samples were then ground up with a ball mill grinder, packed into tin capsules and analyzed for Total Carbon and Total Nitrogen on a Costech elemental analyzer. A second batch of soil samples were packed into silver capsules, acified with HCL fumes and then run through the elemental analyzer. The acidified analysis helped determine if the soil on site had carbonates (or other inorganic carbon). We collected intact HYPROP soil cores from each depth (0 – 10, 10 – 20, 20 – 30 cm) each core was analyzed using the METER KSAT for saturated hydraulic conductivity, then the core was transferred to the METER HYPROP to collect soil water retention data. Subsamples from the HYPROP Intact cores were collected and analyzed on the WP4C to obtain soil water retention data points on the drier end (plant wilting point). KSAT, HYPROP and WP4C analysis was conducted between August 2018 and January 2019. The data set from those analysis are currently being organized and categorized for analysis. Significance of sample depth: collecting the sample from 0 – 10, 10 – 20 and 20 – 30 cm will provide insight on how tillage and management affects soil at depths generally affected by more complex conditions (15 – 30 cm). Significance of Saturated Hydraulic Conductivity data: saturated hydraulic conductivity values can help predict farmland flooding and pooling. Significance of soil water retention curve: comparing different curves from the 6 FST treatments will help predict the behavior of the soil at various climatic/precipitation conditions. Preliminary results are currently being statistically analyzed. Conclusions are pending statistical analysis. 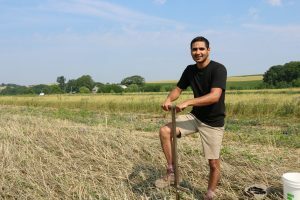 As a research intern at the Rodale Institute between May and August, field experience allowed me to comprehensively understand the complexity of our food and agricultural systems. I presented the objectives, proposed analyses and narrative of my research project to Rodale Researchers, ASC (Agriculturally Supported Communities) future farmers and Rodale staff. Each presentation was specifically prepared for the target audience to ensure clarity of information. The input and questions about the project were logged and documented to help me improve future outreach presentation after data analysis was completed. A profile was prepared by Rodale’s communication department about my project. I am currently working on an interactive website presentation about my project, it is expected to include an interactive map of FST and user-oriented data visualization methods. 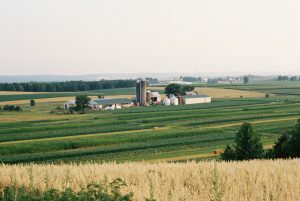 It will provide a predictive platform that will allow me to determine how (organic and conventional) farmers in Pennsylvania will be affected by variability in rainfall and drought. This is mostly based on the data that will be collected for the soil characteristics. It will provide farmers with a prescriptive tools (different tillage methods and different nutrient input sources) to help them determine which climate adaptation tools will fit their crops, geography, soil type and preferences. It will provide the foundation for the analysis of future comparative farming experiments in addition to helping increase the complexity of research models correlating soil health (and soil organic matter) to soil hydraulic (and water retention) properties. One of the most eye opening realization is how agricultural management methods and crops can vary not only from a farmer to another, but also climatically, geographically and through market forces. The complexity of our agricultural system as a whole makes solving the problem of farmland sustainability and food security a multi-faceted problem that requires cross-disciplinary solutions. Those solutions will need to interconnect social, economic, ecological, environmental and global solutions. One example that resonated with me during conversations with farmers was how crop insurance for organic farmers seemed to be non-existent due to lack of government subsidies.